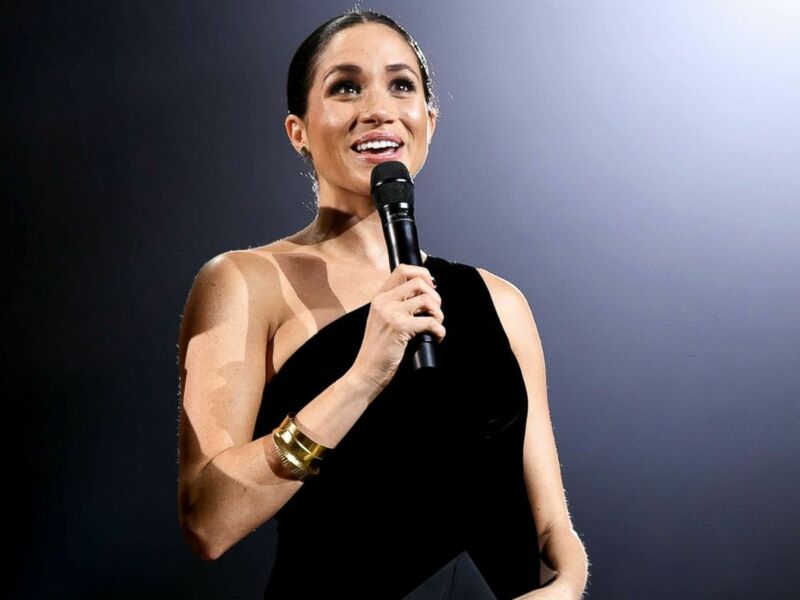 A glowing, pregnant Meghan Markle made a surprise appearance Monday night at the British Fashion Awards to honor the designer of her wedding gown during the British fashion industry's big night. The Duchess of Sussex presented the British Designer of the Year Womenswear Award to Clare Waight Keller, the first female artistic director of the fashion label Givenchy, at the Royal Albert Hall in London Monday, where she made an unannounced appearance during the awards show. Clare Waight Keller is watched by Meghan, Duchess of Sussex and Rosamund Pike as she speaks after receiving the award for British Designer of the Year Womenswear Award for Givenchy during The Fashion Awards 2018 in London, Dec. 10, 2018. 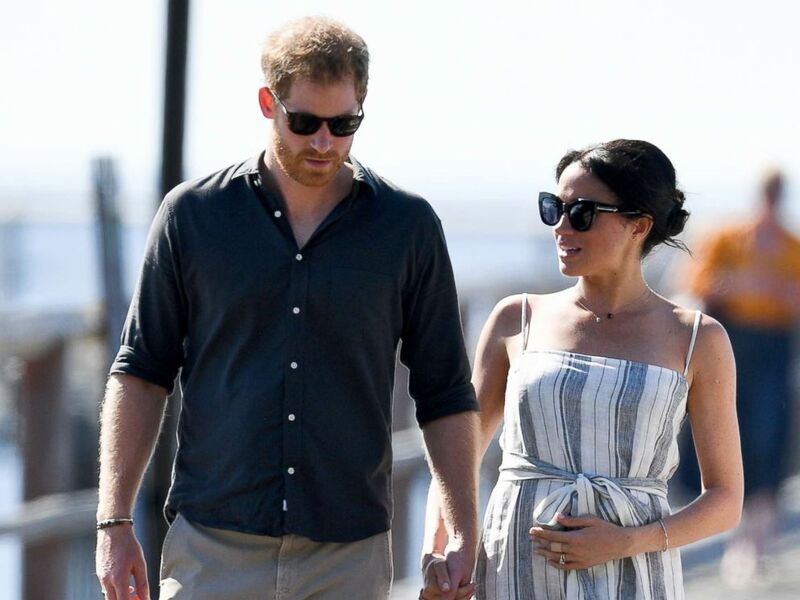 While her growing baby belly stole the spotlight, Meghan's fashion ensemble also turned heads. She donned a black one-shoulder Givenchy velvet gown and had her hair pulled back in a sleek low bun for the occasion. The duchess also rocked gold bangles and bold, dark nail polish -- which many were quick to point out on social media breaks with royal tradition. "As all of you in this room know, we have a deep connection to what we wear, sometimes it's very personal and sometimes it's emotional," she said during remarks before presenting the award. "But for me this connection is rooted in really being able to understand that it's about supporting and empowering each other, especially as women," Meghan added. Meghan, Duchess of Sussex on stage during The Fashion Awards 2018 In Partnership in London, Dec. 10, 2018. Waight Keller gave the duchess a hug as she accepted the award, then told the audience she had to "take a moment" because she was so "shocked." Meghan, Duchess of Sussex during The Fashion Awards 2018 In Partnership With Swarovski in London, Dec. 10, 2018. She also thanked Markle during her speech, saying, "this woman is so amazing." "I've gotten to know Meghan on such a personal level, and you know, to have someone like that trust you in an incredible moment in their life, is something that is just the most unbelievable honor," Waight Keller said. Millions around the globe tuned in to watch Meghan tie the knot with Prince Harry last May, where she donned Waight Keller's custom gown, made out of triple silk organza, featured an open bateau neckline with three-quarter-length sleeves.